Ages 4 through 9. 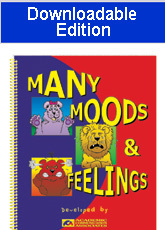 Help children use language to express feelings such as happiness, confusion, sadness, disappointment, and anger with the activities in this book. The animal pictures each depict a specific mood or feeling. Each picture is accompanied by a simple story. Students are asked to talk about situations in which they have experienced feelings similar to those of the story characters. Fun with Feelings. Each of the reproducible picture cards in this section depicts a feeling experienced by a character in a short story. Questions relating to the feelings experienced by the story characters follow each story. Tell your Story. Each of the worksheets in this section includes a story title and an illustration. The student is asked to create a story for each picture and to use specific "feeling words" in the story. Share your Feelings. The worksheets in this section each show pictures of various facial expressions. The child is asked to describe how each character is feeling and to describe situations in which he/she has experienced similar feelings. All of the activity worksheets may be reproduced.